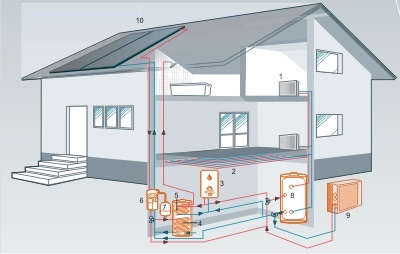 Hot water from collectors (10) heats the main heat exchanger (4) containing domestic water. The extra energy is driven to the buffer tank by the secondary heat exchanger (5). 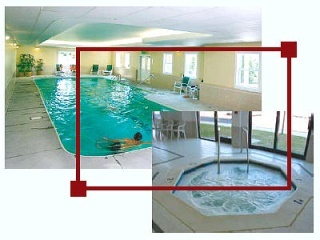 The buffer tank (8) contains hot water needed for space heating, through under floor installation (2) or radiators (1). The solar energy deficit is compensated by conventional heating sources. The most popular system is the gas heating unit (3); but heat pumps (9) gain more an more popularity as a completing energy source. The heating system base on gas compression-evaporation cycle and is more efficient than the conventional heating methods with gas or electricity. GRUP ROMET offers a solution that provides 50% less bill price, by installing an environmentally friendly heat pump for your home. The heating system with air-water heat pumps is the following: the heat pump contains a special echological gas which by compression releases large heat quantities. Heat is transferred to water through pipes installed under the floor or through the radiators used for space heating. Moreover, when the heat pump is set up on cooling mode, during summer, the floor will be cooled and the ventilators will introduce cool air. Heat pumps represent one of the safest and realiable existing heating systems as they use no fuels and produce no flames. They are designed to adapt to any structure, of any size, from new buildings with smaller energy consumption, to large older residences. Such pumps can provide both heating and cooling. In principle heat pumps operate like a refrigerator. A refrigerator extracts heat from food, while the heat pump extracts heat from environment, even if this is cold. If the outside temperature is -20�C, the heat pump is capable to extract sufficient heat for heating a house at the desired temperature. Heat pumps can also be used for heating swimming pools, being equipped with heat exchangers made in resistant materials, providing long life and maximum corrosion protection.